Have you ever wondered how mahogany furniture is manufactured? The process is surprisingly complex. It begins with the selection and purchase of the finest mahogany lumber and involves highly skilled artisans and craftsmen, hard working and detail-oriented factory crews, experienced, top-level management, exceptional organization, plus an optimized shipping procedure designed to guarantee every purchase is treated with exceptional care. Our goal is to ensure delivery of high end furniture, formal dining furniture, mahogany dining tables, conference room tables, mahogany dining chairs and other fine furniture for a fair and reasonable price - anywhere in the world, as promised, on-time and in perfect condition. 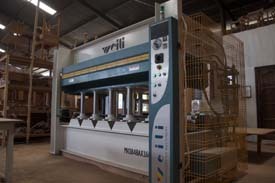 This virtual furniture factory tour of our Indonesian furniture factory is designed to be both informative and fun. It will introduce you to the people involved in making both our reproduction furniture and designer furniture, the capital equipment we use to ensure each item meets our demanding specifications, and our manufacturing process and shipping routine. To make for an easy viewing experience, the tour is divided into several parts based on the factory operation being highlighted. Use the navigation bar on the right side of the page to simply choose your topic of interest and advance to that segment of the tour. For more detailed technical content relating to mahogany furniture or luxury dining room furniture in general, visit our "Getting Technical" blog. The following pictures provide a glimpse of what you will find inside the Antique Purveyor Factory Tour. 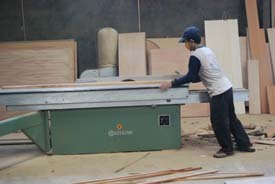 You'll see photos of our Indonesia furniture facility, the people behind our manufacturing process, the government approved, majestic mahogany logs from which we build our high-quality veneers, and some of the machines and equipment used by our master craftsmen to produce the fine, high end dining tables, mahogany dining room furniture and reproduction furniture on which we have built our reputation. We hope that by enjoying this brief furniture factory tour, you'll begin to realize how much thought, preparation and hard work goes into producing our Antique Purveyor product line. To get started, click on the navigation items listed on the right side of this page. 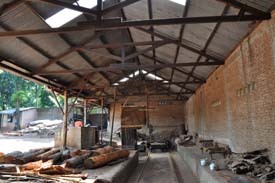 Raw materials at our Indonesia factory After initial rough cuttings, wood is milled inside our factory. 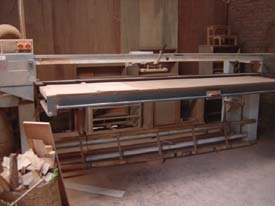 Our veneer press, left, and industrial saws, right, are large and expensive but used continuously on a daily basis. 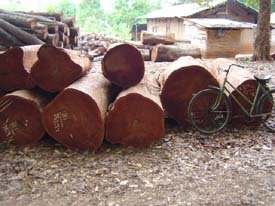 Mahogany logs are often huge and require a lot of work to reduce them to a manageable size. You might be surprised at how big an operation is required to design, manufacture and ship upscale, high end furniture across the world. As you can see from the photos above, and in the ensuing pages of our furniture factory tour, the process entails procuring the finest raw materials, significant capital investment in the proper equipment to do the job right, and hiring a team of exceptionally skilled artisans, craftsmen, managers and supervisors to ensure quality control and a smooth, organized work flow.